If you need a replacement activation code for a Clean Run Course Designer activation license you previously purchased, click here. This need can arise, for example, if you sell or discard your original computer, or replace your computer's hard drive. If you're interested in an iPad, Windows RT, Android or Kindle Fire version of Course Designer, click here. The answers to most questions about how to use Course Designer 4 can be found in Course Designer 4's help files. To view Course Designer 4's help files, use Course Designer 4's "Help / Contents..." or "Help / Index..." menu item. 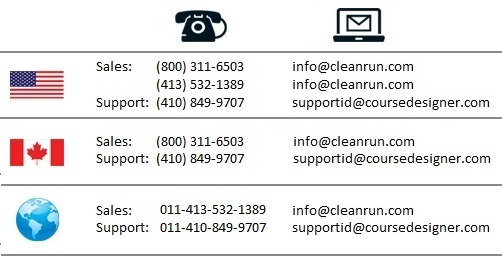 If Course Designer 4 appears to be working incorrectly, even after consulting the help pages, please report the problem to info@cleanrun.com. For all other questions or comments pertaining to Course Designer, contact info@cleanrun.com.